Taken with Olympus E500 digital camera April 2nd 2008. Click image for larger view. After a period of not taking any pictures I got some inspiration today and went out on a photo trip. I found an area where some Scots pine trees (Pinus sylvestris) were growing wild. I really liked the form on this little tree and the snowy scenery made a good background for a picture. The mountain peak is many kilometers away, but I used a zoom lens to make it look closer. Scots pine is the only pine tree species growing wild here in Norway. It can reach 40 meters and there has been found trees that are over 800 years old. Reminds me a little bit of a bonsai tree. Once again – another superb photograph. I always look forward to seeing your new photos – this one is really beautiful, and I like how you made the mountain appear closer. Thanks so much for sharing your work! Very nice photograph! I agree with Book Calendar.. it does look like a bonsai tree. 🙂 And that second tree behind must be really tall. It would be great to take a picture of an angle from the very bottom trunk and see the magnitude of its height all the way to the top. Would be looking forward to see more of your works. I love Scots Pine, they grow in a very unique way and I love the colours in this shot. I just wanted to finally leave a comment and tell you how much I love your blog. I am descended from Norway, and love your photos very much. Thanks! I love your pics because we don’t get much snow here around Los Angeles and if we do you have to go way up in the mountains to get to it. 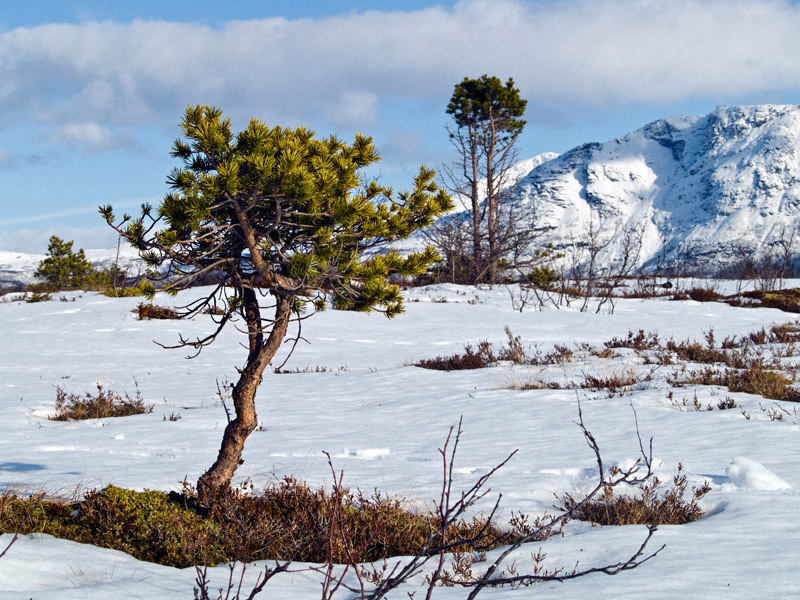 Very nice Scots pine tree standing out in the snow landscape background ! Makes it look very green ! They are great. Jungl. Are these what are called, ‘Troll trÃ¦r”? Or, am I thinking of a different type? Hey there.. You produce some wonderful photos.. I’ll really appreciate your work.. It’s fantastic. You are an amazing nature photograher. Keep going!